The Australian cockroach is relatively large. In appearance, adults are similar to the American cockroach; but the body is a darker brown, the yellow markings on the pronotum are more clearly defined, and the foremargins of the forewings have a distinct yellow marking. Egg cases that are dropped or glued to surfaces by females may contain up to 24 eggs which, after hatching, require some 6-12 months for nymphal development. Adults seem to live about 4-8 months, during which time females may produce up to 20 egg cases. Preferring food of plant origin, this cockroach may be encountered in greenhouses and under bark and leaf litter in gardens. As well, it is found in subfloor voids, wall voids, roof voids, around utilities in factories and other buildings, in outhouses, and in and around woodpiles. It tends to be more frequently encountered in warm, subtropical conditions. 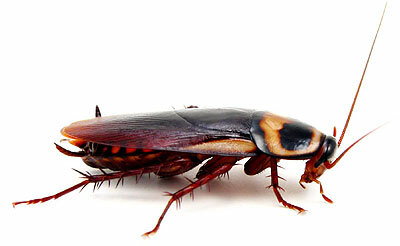 The American cockroach is probably the largest cockroach that infests dwellings and utilities. Adults are red-brown in colour with a pale yellow border around the pronotum. Egg cases are usually dropped or glued to surfaces within reasonable proximity to food and water. Up to 16 eggs hatch from each egg case, and the nymphs may take 6-12 months to develop into adults. Adult lifespan may be 6-12 months and females may produce up to 50 egg cases. As the American cockroach prefers warm, moist, dark conditions, it tends to live indoors in colder regions but mainly outdoors in warmer regions. Partly because of its large size, it tends not (so often) to infest the dwelling parts of buildings (unlike the German cockroach). Nevertheless, it is a very widespread pest, occurring in wall, roof and subfloor voids and in and around sewers, drains, moist cellars, grease traps and rubbish dumps. Buildings infested or visited include hospitals, bakeries, food stores, warehouses, factories and domestic residences. residences. It seems to have preference for decaying organic matter, but will eat most human or animal foods and also book bindings, paper and clothing (particularly if soiled). Adults with a water source may survive for about 2-3 months without food. 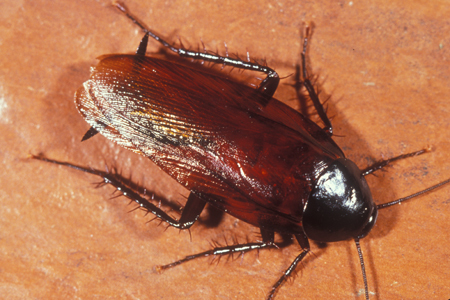 The Smokybrown cockroach is relatively large, and adults are dark brown to almost black with no pale markings. Its life history is somewhat similar to that of the American cockroach. Egg cases dropped or attached to surfaces by females may contain up to 26 eggs, which, when hatched, may require 6-12 months for nymphal development. Adult lifespan is probably about 6-12 months, and during this time, a female may produce close to 20 egg cases. 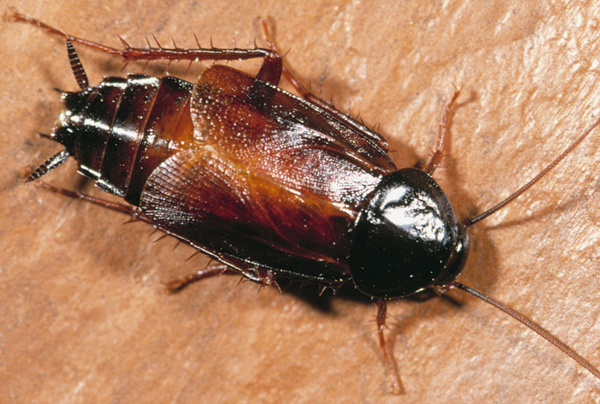 The habits of the smokybrown cockroach are in some ways similar to those of the Australian cockroach, and it is often found in garages, sheds, subfloor areas, roof voids and in and around grease traps and drains. The Smokybrown cockroach does, however, seem to have a particular preference for food materials of plant origin, so is often a pest in greenhouses, nurseries and gardens. It is most often regarded as an outdoor species, and very seldom does it infest the dwelling parts of the buildings.Adults are fully winged and can fly short distances in warm conditions, often being attracted to lights at nights. The brownbanded cockroach is relatively small. Adults are pale brown in colour with very pale bands across thorax and abdomen. The females wings are somewhat reduced while those of the male extend past the abdomen. Egg cases, which may contain up to 18 eggs, are glued to surfaces and the hatched nymphs require 2-4 months to develop into adults. Adults typically live for up to 6 months, during which time the female produces up to 13 egg cases. 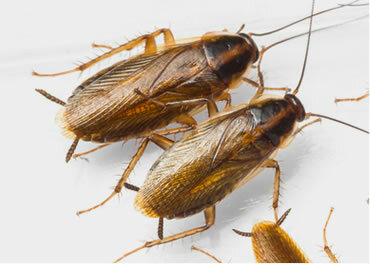 This cockroach tends to be an indoor pest, frequently infesting the dwelling parts of buildings, as well as offices, hospitals, restaurants, storerooms and so on. Unlike the German cockroach, however, its activity may be scattered throughout a building rather than being restricted mainly to kitchen areas. The medium-sized oriental cockroach is dark brown to black. The female has much reduced wings, while the male has wings that cover most, but not all, of the abdomen. Egg cases are usually glued to surfaces and may contain 16 eggs. Nymphal development may require 6-18 months. Adult lifespan is usually about 3-6 months, and a female may produce up to 14 egg cases during her adult life. 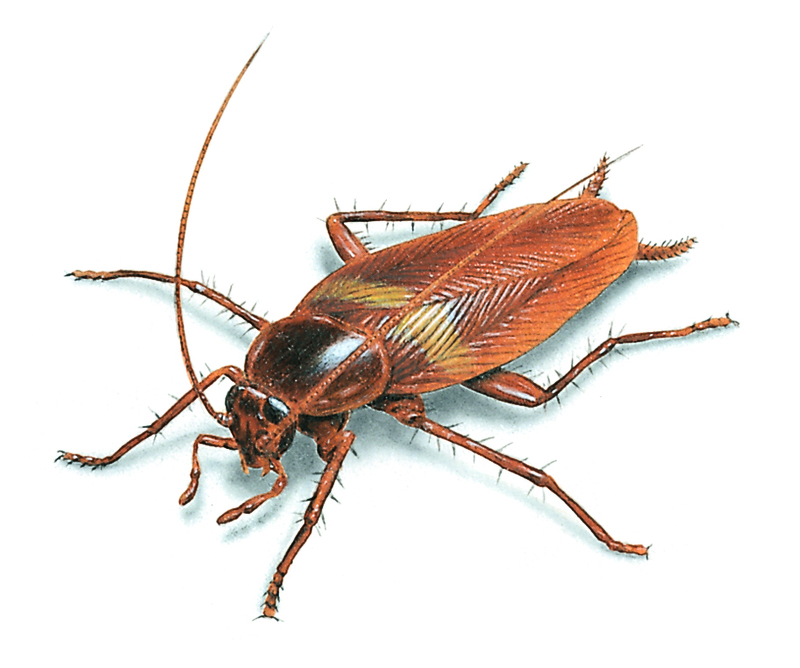 The oriental cockroach is the major pest cockroach of buildings in Britain. Its preference for relatively cool conditions in reflected in its most southern distribution in Australia, where it is commonly encountered outdoors (under leaf litter and bark) and in damp subfloors, around drainage systems. It is relatively sluggish and is usually located at or below ground level in buildings. It feeds on a variety of decaying organic matter, frequently feeding in garbage disposal areas. As well, starches and sizing of wallpaper and books may be attacked.